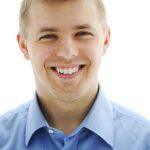 How many types of barbells are there? From the top of our heads, there are the regular old straight barbell, the EZ curl bar and…well, that is all you can find in most gym. Yet there is another type of bar that we don’t get to see as often, but is still very useful, both in the gym and at home. That is the tricep bar. What is a Tricep bar (hammer curl bar)? How much does a tricep bar weigh? This tricep bar stands out from the crowd thanks to its top-notch ergonomics. The two handle bars are placed at just the right distance apart. This will give you a close, but still comfortable grip which will tap right into your tricep when doing overhead extensions or bench press. However, larger users might find the grip to close for hammer curls. The rotating sleeves will add extra comfort during your training by allowing the weights to rotate as you do your reps. The grip size is 1 inch which will feel very comfortable for most athletes. Looking at the overall build quality you will notice that the welding seems super solid and the product feels like it will last forever. All Olympic discs will fit just right on the Titan Fitness tricep bar and the standard size locking clamps will hold the weight in place firmly. These do not come with the bar though, so you will need to purchase them separately. The bar itself weighs around 25 pounds and it can securely hold a combined weight of 200 pounds. 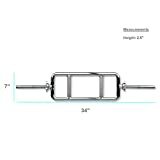 If you are looking for a medium weight tricep bar this might be one of the best products to consider because the bar alone weighs around 20 pounds. It will fill Olympic discs and it can hold a combined weight of 200 pounds. 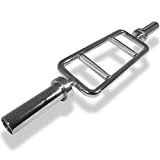 The distance between the two handles is larger than in other similar products which makes this bar particularly good for exercises such as hammer curls and even bent-over rows. Of course, you are still able to activate the tricep as well. 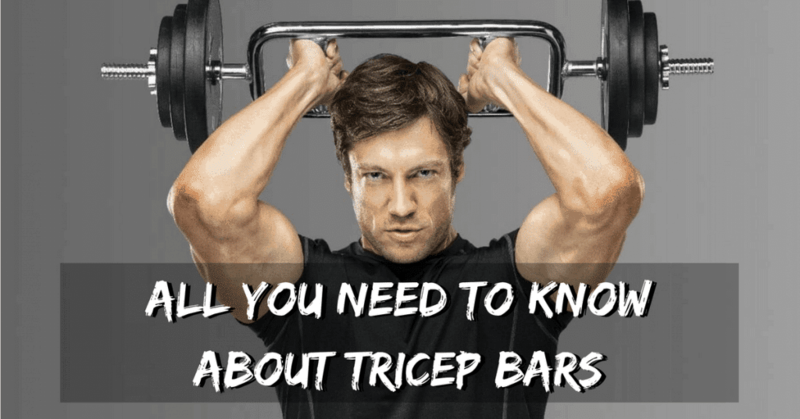 If you are a smaller user, however, you might want to consider getting a tricep bar which offers a closer grip. Otherwise, your hands will be pointing outwards on your hammer curls, and the workout will not be as effective. The knurling on the handles is very good and it will help your grip when using heavy weights. The revolving sleeves are there as well, so that’s another plus. The overall finish of the product is great, and looks solid enough to load it up with weights. This is probably one of the lightest tricep bar you can get your hands on, at only 17 pounds. Despite its low weight this is a full size 34” bar. The handles are around 8 inches apart which is more than average. Therefore it will take a lot of pressure off your wrist and shoulders but you might not be able to feel it working the tricep as good as a closer grip bar. But you will definitely enjoy this on if you are a larger user or you have a bigger shoulder width. Alder Sport has included a pair of 1 inch spring collars. The bar can’t hold Olympic weights, you will have to buy standard weights. So bare that in mind when shopping. Even though the overall finish and quality of the product seems OK, we are not very convinced about the knurling. It is not as deeply cut into the steel and it doesn’t seem to offer an optimal grip. But maybe that is something you can overlook if you are not lifting too heavy. This is another 1 inch (Standard) tricep bar which will work with standard weights only. So, if you already have standard weights at home it might be one of your best picks. Given that it’s a smaller bar, it is also lightweight – around 15 pounds. The knurling is kind of smooth and you can’t really have a good grip of the bar when using heavier weights. On top of that, the sleeves are not revolving so that will put even more stress on your grip. Other than that the bar looks like it is built really well, there are no visible issues with the welding and the finish of the bar make it look like a premium product despite the low pricing. It comes with a pair of caps which are supposed to keep the weights in place, but they don’t really do such a good job at it because they spin off really easy when you are working out. Lastly but not least we are looking at another Olympic size, heavy tricep / hammer curls bar. This 22 pounds bar offers one of the widest grips we’ve seen – 8.75 inches. This will work great for hammer curls, bent-over rows, but you might not feel it that much in the triceps when doing overhead extensions. The bar has a very nice finish to it, the chrome plating looks spot on, but the welding job is one of the sloppiest you can see in a tricep bar. It might do the job on holding the bar together but it looks very unprofessional. Another thing we didn’t like about the Body Solid tricep bar is that it does not feature revolving sleeves which is rarely seen in Olympic sized bars. This will add extra stress to your wrists and the bar simply does not feel comfortable anymore. The knurling looks decent enough to give you a good grip. To make things extra simple for you, just in case you can’t make your mind on which tricep bar to buy, we selected our top two picks – one Olympic bar and one Standard bar. 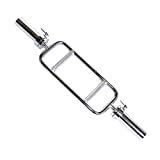 Alder Sport Regular 34″ Tricep Solid Bar is a good pick for those who want a nicely crafted, lightweight Standard bar. The grip is not too wide and not to narrow which makes it perfect for most users and for performing a variety of exercises efficiently. On top of that, it comes with a pair of spring collars for securing the weights. 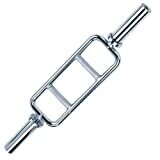 Titan Fitness Tricep Hammer Curl Weight Bar is our choice for using with Olympic plates. It has one of the best ergonomics you can find in any tricep / hammer curl bar and looks really heavy-duty. The grip is good enough and it is also very comfortable to use with heavier weights because of the revolving sleeves. 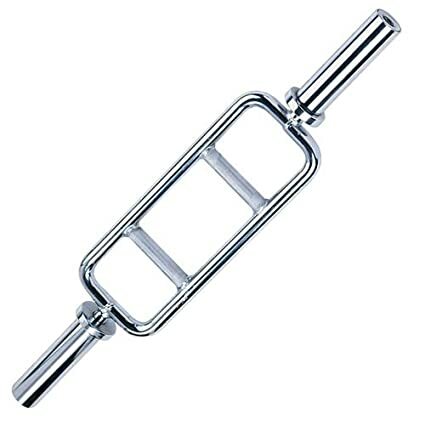 A tricep bar is an oval-shaped bar with two or more handles inside of it. It is mostly built for isolation movements like bicep curls, tricep extensions and front raises (and others), but can also be used for compound exercises like the close grip bench press. The weight of various tricep bars varies between 15 and 45 pounds, but most are around 20 to 30. I’d recommend not going below 20, as that means that the bar will be either hollow or of lesser quality, neither of which you want. The heavier ones will be made of sturdier materials, but for a beginner, 45 lbs might be too much to use for exercises like bicep curls and tricep extensions. Consider that before making a decision to buy. The tricep bar has one major benefit over regular bars: the grip. Most bars in the gym are straight. This works well with most exercises, but in some, it puts unneeded and potentially dangerous pressure on the wrists. Many people experience pain from doing straight bar bicep curls or tricep extensions: a tricep bar is meant to fix that very problem. The grip that you have on the tricep bar is called the hammer grip or the neutral grip. In the hammer grip, your palms would be facing each other, as opposed to the overhand grip (palms facing away from you, like with pull-ups) or the underhand grip (palms facing towards you, like when doing chin-ups). This grip recruits the greatest amount of muscle mass and is the strongest position in most people. Usually, you will be able to do more pull-ups or bicep curls with the hammer grip. It is a great grip to use when you are developing strength: for example, with weighted pull-ups or heavy bicep curls. 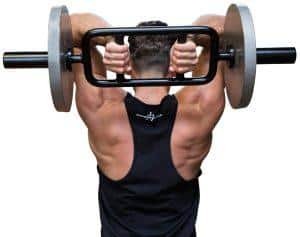 Another benefit specific to the tricep bar, which is also connected to the grip, is the ability to target the brachialis, which is a muscle just between your bicep and triceps. When this muscle grows bigger, it pushes the other two arm muscles out, making your arm “pop” and look bigger. Training it could be the missing piece in your training and finally lead you to bigger arms. Hammer grip curls are the best way to target the brachialis. By not turning your arm out (supinating your grip) during the movement you are putting the bicep in a mechanically disadvantaged position, which is exactly what we want to target the brachialis. If you are one of the people who have tried doing tricep extensions with a straight bar (or even with an EZ curl bar) but found them too painful, using a tricep bar will likely solve this problem. A straight bar puts the wrist in a bad position if you do not have a very mobile wrist. The tricep bar works around this by using the hammer grip. The tricep bar can, despite the name, be used for more than just training the triceps. It can be used in a variety of exercises that hit every part of your body. One of the best exercises to target the brachialis. If you want to add size to your arms and make them look bigger, this should be one of your isolation movements. Done with a slow eccentric for sets of 15, you will get a serious pump going on. These are your go-to when you really want to hit the front delts. 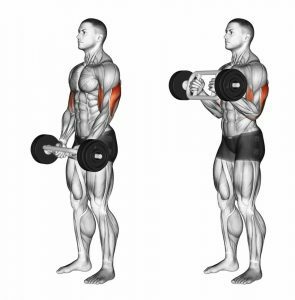 Done with the tricep bar these will even target the biceps in the extended position, which is generally their weakest position – and the source of potential gains. After all, gymnasts get their huge bicep peaks from straight arm work like the planche, iron cross and the maltese. A problem that is common with a lot of tricep exercises, like the close grip bench press and skull crushers is that they don’t work all of the heads of the tricep equally. The long head needs to be trained with overhead work. Since you will be using both hands, you can go quite heavy on these. The position of the handles on the tricep bar makes it ideal for close, hammer grip bench press. This is another great exercise for the triceps and again, is more comfortable on the wrists due to the parallel grip. Starting to see the pattern? A favorite of old-time bodybuilders and a real classic. Fun fact: in the time before weight stands for the bench press it was customary to do a pullover to get the bar in the starting position. Needless to say, it was a time when some seriously heavy pullovers were done. Today, we don’t do that anymore, but the pullover is still a very useful exercise to target the lats. Here is a simple tricep bar workout you can do. Combine the above exercises in a circuit; feel free to add your own. Do the circuit with little rest three to five times for an effective and quick home HIIT workout that will build your muscle at the same time it burns fat. 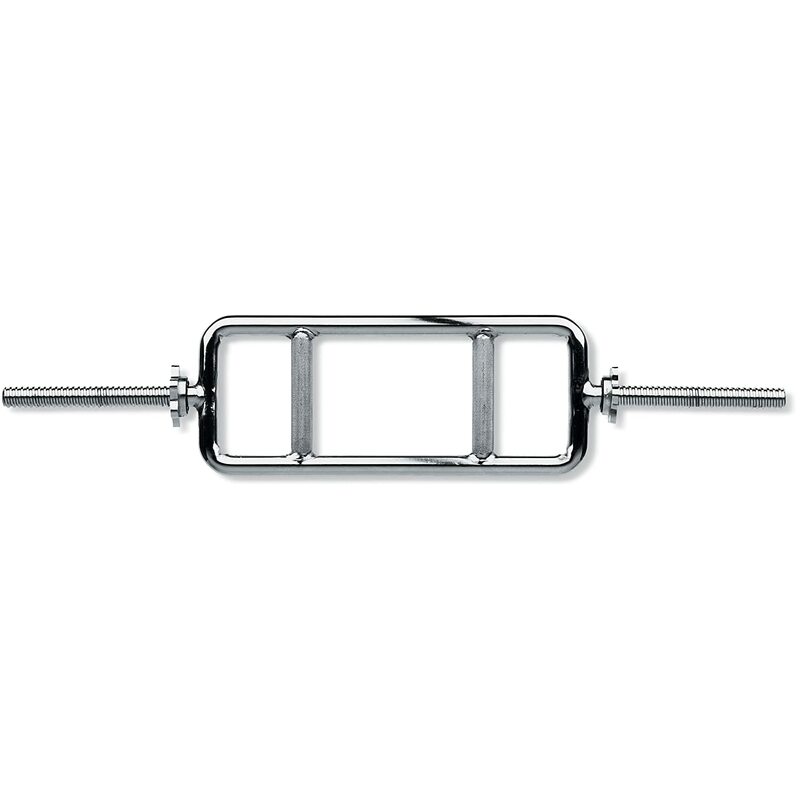 The EZ curl bar is another popular bar shape commonly used for isolation exercises. The bar is made with many kinks, which can be used to alter the grip angle. 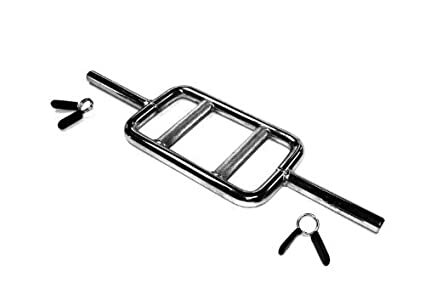 Both the tricep bar and the EZ curl bar are useful for different purposes. The tricep bar a great tool to have in your arsenal. It is not as necessary as the straight barbell, but it does perform a useful function in the gym. 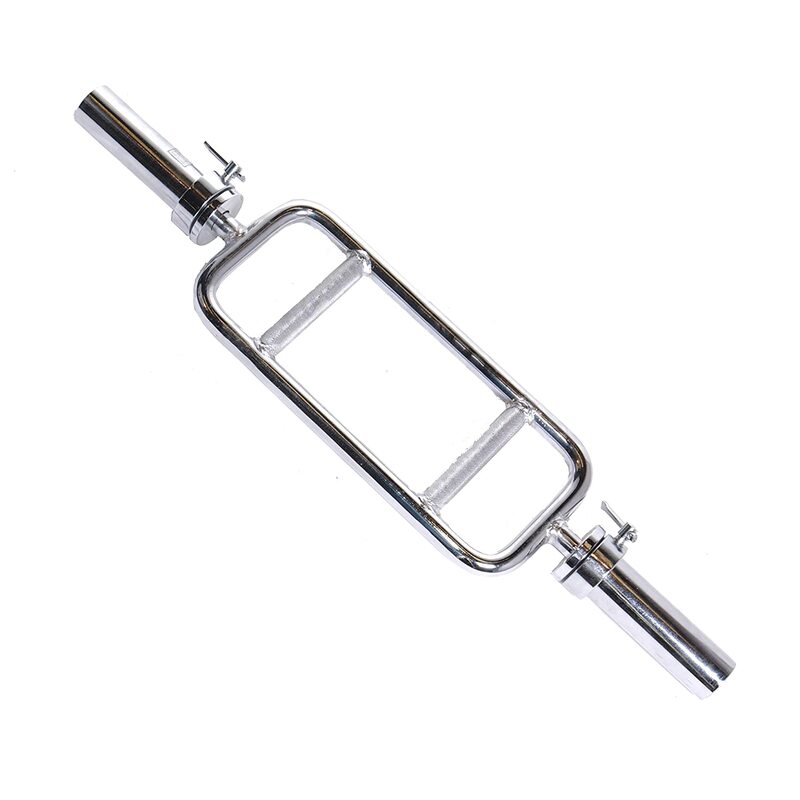 If you are looking to add one to your home set up, it is a great multi-purpose bar that can be used for a wide variety of exercises while being small enough to tuck behind a drawer. This seems like an awesome bar. I definitely need it for my triceps!